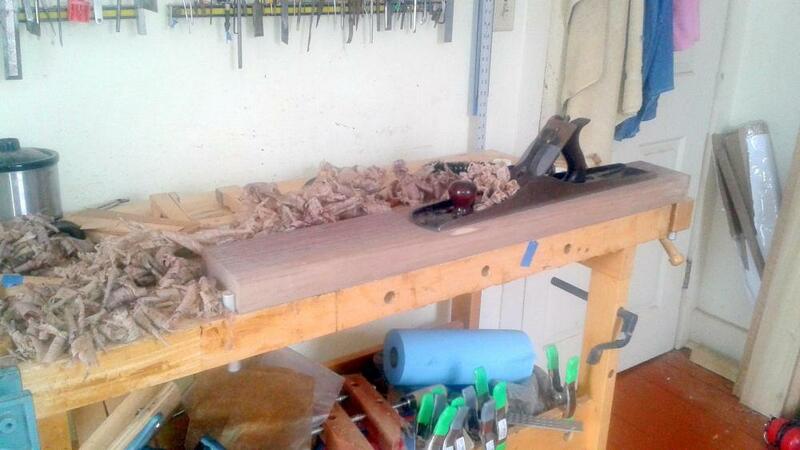 Today I am taking a break from a few dulcimers in progress so I can prepare wood for resawing. This piece of quartered walnut was very dry when I bought it rough-sawn a few years ago and has only gotten better with age. Wood needs to be fairly square and true before resawing and for me that means lots of hand-planing. Sitting on top of the walnut board is a #7 jointer plane. The jointer plane needed a break so I took its moment of rest as an opportunity to take a grainy and slightly color-distorted photograph. Bad photograph or high art? Isn’t that roll of blue paper towels just lovely? And I am shopping for a better camera. Hmm, a dilemma. But I digress…. I enjoy hand-planing and it provides a good physical workout. Current back issues do not allow me to do as much planing as I would like to do in one stretch so I have to spread the joy out over longer periods of time. When my body has been more cooperative it took surprisingly little more time for me to hand prepare wood for resawing than it does for my friends who use big machines to flatten and square stock. I briefly considered getting a thickness planer; only briefly. I don’t know where I would put such a beast in such a small shop. And I’d need another extension cord. And I’d have to clean up after it and take it for walks. But really, I truly enjoy hand-planing and prefer to work that way. I like the feel of the plane in my hands, the feedback of the plane against the wood, and the quiet swooshing sound made as shavings tumble. Your workbench looks better than mine. I am not using a hand plane but have recently finished a music stand for my wife (only took 3 years). I am now working on a stand for our hammered dulcimer. We have had the dulcimer 20 years and never played it. We went to workshop and decided it was time to play it. I know this is long but I hadn’t done much woodworking because of a kickback from a table saw a few years ago. I am just now starting to work a little with wood. That is one problem with power tools. The first time I used a table saw I got hit with a board the kicked back and never forgot it! Glad you are working on projects; as long as you enjoy the work it doesn’t matter how you get there!